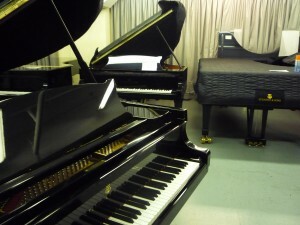 To Steinway Hall in London, to choose a piano for the Florestan Trio’s Hyperion recording of Shostakovich next January. Whenever I’m able to select an piano, I have to do my research well ahead of time, because the best ones get booked up months in advance. Each piano is slightly different from the next, so for each new project I might make a fresh choice. In the basement of Steinway Hall lives their ‘concert fleet’, a group of top-quality pianos which go out on hire to concert halls around the country. Because they’re in and out so much, it’s a logistical feat to hit on a day when the pianos I want to try are all in the building at the same time. So when Steinway phoned today to say that three of the likely pianos were all in the basement, I jumped on the tube and went to try them. Because the fleet of pianos is constantly updated, and old favourites are retired, it’s difficult to keep track of them. I rely on the advice of Ulrich Gerharz, Steinway’s chief technician, who has always given shrewd advice about the right piano for any given project. When I told him about our Shostakovich CD, he nominated a particular piano I’d never played, and so I was keen to try it. Next to it in the basement were two other old favourites I’ve used on previous recordings (I knew the pianos by their serial numbers). I only usually encounter them one at a time, so it was a treat to be able to hop from one to the other for a luxurious hour. Ulrich was quite right about the Shostakovich piano; I could feel that right away. But I was also able to plan some future bookings by matching other repertoire to particular pianos. Sometimes the difference between pianos is easy to describe: a more cutting sound, a mellower singing tone, a faster mechanical action. But usually it’s more a matter of finding a piano that feels subtly right when you’re playing a certain piece of music on it. Though pianos are inanimate objects, it doesn’t feel that way when you’re playing them. This entry was posted on Sunday 18th October 2009 at 7:00am	and is filed under Concerts, Daily Life, Florestan Trio. You can leave a response, or trackback from your own site. How do you manage to choose the most suitable piano in an acoustic (Steinway hall)different from the acoustic in which you will eventually record/perform? You’re quite right, Martin, it’s difficult to choose a piano in a very different acoustic from the one in which you want to play it. For me I suppose the decision is mainly made on how it feels under my hands. I’m used to practising at home in a small room, and to ‘scaling up’ in my imagination, so I guess I’ve got used to making educated guesses about how pianos will sound in bigger rooms.